Out of the blue, the leading manufacturer has introduced the Nokia E52, coming as a replacement to the E51. The new phone, equipped with a 2.4-inch screen, surely reminds us of the company’s new design language of business phones, also used in the E55. A bit out of the ordinary, Nokia directs our attention to no other feature, but the battery of the phone. This adds up actually, since you will be able to talk for whole 8 hours before you’ll need to recharge the phone. Come to standby time, the E52 should be able to provide a standby of no less than 23 days. Nokia also touts it for its noise cancellation technology that is said to significantly improve your experience during a call. There is also a little something for those of you that feel like actively using their phone at work. Mobile VPN now features Call Connect to ensure you are easily contacted on a single number. 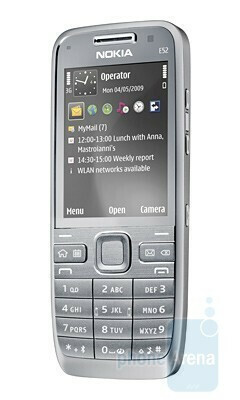 The phone also supports Nokia Messaging, Mail for Exchange and IBM Lotus Notes Traveler, so you can enjoy email functionality while working. Come to bonus features, the manufacturer has taken care to provide basics most customers are likely to need, such as 3.2-megapixel camera, A-GPS and HSPA connectivity. Throw 1GB microSD memory card that comes in the box and two different color solutions into the deal and there you go – a brand new feature-packed business phone. The good news is many people will feel tempted to get one, as there will be two quad-band GSM versions, designed to work on European and American 3G bands. 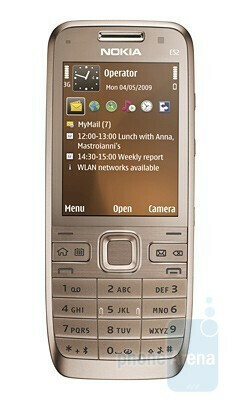 Expect the Nokia E52 in the second half of the year, coming at a price of $326 (Euro 245) before taxes and subsidies. And while you’re waiting for the official launch, we can all set to watching that fancy hands-on video over and over again! Cool, isn’t it? this phone would be great for my wife!!!! lol blah blah blah.... for days!